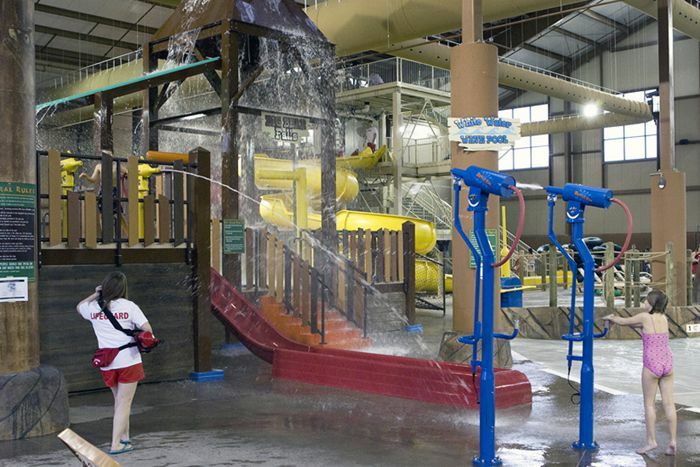 There are plenty of things to do besides skiing at Greek Peak, including splashing around at Cascades Indoor Water Park, part of the resort's Hope Lake Lodge. The climate-controlled park offers year-round, bathing suit-clad fun. After a winter day spent careening down the slopes, you could careen down the water slides. Then again, you could barrel down the slides on a rainy summer's day (or in any other weather during any season). By indoor water park standards, Cascades isn't especially large, nor does it have the marquee attractions found at bigger, more full-featured indoor parks such as a "FlowRider" surfing simulator or a water coaster. But it does have a nice collection of attractions including a wave pool, water slides, and an interactive play center with a tipping bucket. Two slides, a body slide and a second one which riders navigate aboard single- or dual-passenger tubes, are the two most thrilling rides at the park. They begin and end indoors, but the enclosed tubes extend outside the building as well. At the other end of the thrill spectrum, Little Bear Falls is geared for small tykes. In between, Cascades offers slides and other attractions that visitors of all ages and thrill tolerances could give a whirl. The water park is open to registered hotel guests and condo owners at Greek Peak. Cascades also offers day passes to the general public. Check with the park for more info. Find deals for Hope Lake Lodge rates at TripAdvisor. In addition to the water park, Hope Lake Lodge offers a video arcade as well as the Bearfoot Den Center where kids can make crafts, go on scavenger hunts, and engage in other activities while potentially making friends with other children. An outdoor adventure center includes zip lines, a laser tag course, and other activities. Greek Peak features downhill and cross-country skiing as well as snow tubing and snow boarding. In warmer months, guests can enjoy the mountain's alpine coaster as well as boating, fishing, hiking, and mountain biking. Hope Lake Lodge offers a variety of accommodations, including standard hotel rooms, suites, and condo units. The resort also has conference and function facilities, a spa, and multiple restaurants and lounges. The Edgewater Cafe at the park offers quick-service fare such as pizza, burgers, and chicken sandwiches. Other dining options at Hope Lake Lodge include the more upscale, waiter-service Acorn Grill as well as the Bobcat Lounge. From Binghamton & points south: I-81N to exit 9. Route 11N to 392W. From Syracuse and points north: I-81S to exit 10. Route 11S to 392W. From Ithaca and points west: Route 13N to Dryden. Go straight through the light at Dryden and then follow 392E to the resort. Note: You will be making a right turn in Virgil at the stop sign to stay on Route 392.